A gift for newlyweds or anniversary celebrants, or a sweet surprise for the one you love to the moon and back. 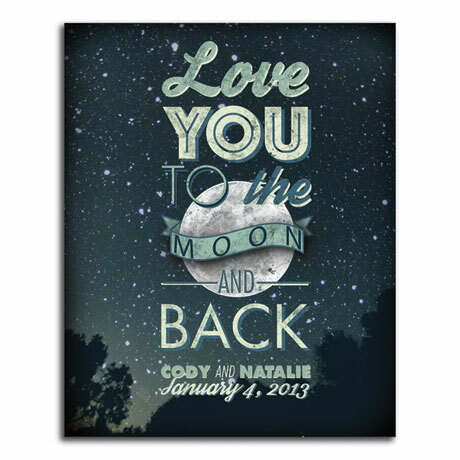 Dreamy print is mounted to a ½" thick wood block with black-painted edges, laminated, and ready to hang from a keyhole in back. Specify names (up to 13 characters each) and optional date (month, day, year). Specify Small or Large. Allow 3 weeks. No rush delivery or gift box. Item can only be shipped within the Continental US.